“Excitement” is beginning to return to the Judea-Samaria Highway, Highway 60. Two rock attacks damaged Israeli-licensed vehicles in Judea. The Judea-Samaria Highway, better known to locals simply as Highway 60, is beginning once again to show some action, with Israeli drivers reporting rock attacks by local Arabs. 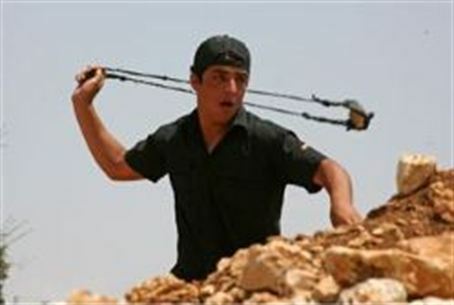 Palestinian Authority Arabs hurled grapefruit-sized stones with sharp, irregular edges at Israeli vehicles Monday at mid-afternoon as they passed the village of Halhul, north of Hevron. One of the vehicles was hit and damaged, though no one was injured. IDF soldiers searched the area for the attackers. About two hours earlier, another vehicle was similarly damaged. PA Arabs hurled rocks at an Israeli-licensed vehicle as it passed the PA Arab village of El Aroub just north of Beit Ummar and south of Gush Etzion, also on Highway 60. None of the passengers was physically hurt, and Israeli soldiers spread out to hunt for the attackers. Although the frequency of rock and firebomb attacks along Highway 60 has abated since Prime Minister Binyamin Netanyahu entered office, there have been a number of deadly terrorist attacks on that road over the past year, the majority of which were carried out by terrorists linked to the Fatah faction led by Palestinian Authority Chairman Mahmoud Abbas, considered by the international community to be a "moderate." Almost exactly one year ago, a Hamas cell ambushed and murdered four Jewish residents of Beit Haggai, including a pregnant woman, who were traveling in a car near the Bani Nayim junction. The Hamas terrorist who masterminded the attack, 34-year-old Nashath al Karmi, was a resident of Hevron. Two days later, terrorists shot and wounded two Israelis – a rabbi and his wife -- traveling in a car along Highway 60 about 15 minutes north of Jerusalem near the community of Rimonim, in the Binyamin region. A terrorist group calling itself the Al-Namir cell of the Al Aqsa Martyrs Brigades, the military wing of the Fatah faction led by Ramallah-based Palestinian Authority Chairman Mahmoud Abbas, claimed responsibility for the attack. Barely a month later, a pregnant woman and her husband were both wounded when terrorists ambushed two Israeli-licensed vehicles traveling on Highway 60 near Tene-Omarim, in the southern Hevron Hills area. The shooters – members of Fatah's military wing, the Al Aqsa Martyrs Brigade, and Islamic Jihad's Al Quds Squad -- missed the first car but struck the second.